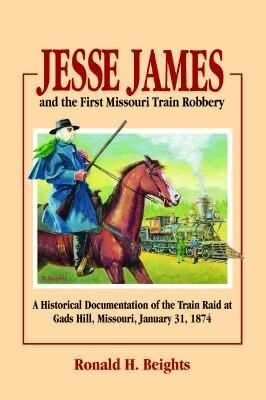 The train robbery by the James-Younger gang in 1874 at Gads Hill, Missouri, was a big news item of the day. American newspapers from as far away as New York and Boston carried the story, and journalists in St. Louis, Chicago, and even European cities wrote scathing editorials about the crime. In time, the excitement subsided, but the raid at Gads Hill had a lasting effect on the lives of the James and Younger brothers. Dramatic events that occurred during the robbery, retreat, and pursuit brought the bandits world-wide attention and became the source for much of the Jesse James legend we know today. Here, told largely by trainmen, passengers, farmers, detectives, outlaws, news reporters, and others who were directly or indirectly involved with the crime, is a true, documented account of Frank and Jesse James, the Younger brothers, and Missouri’s first train robbery. Many of the photographs included have never been published. Ronald H. Beights is a member of the James-Younger gang, the State Historical Society of Missouri, and the Friends of the James Farm. In his long career as a freelance commercial artist/illustrator, he has worked with such prestigious clients as Southwestern Bell, Great American Life, and Rexall. He has published articles in the (Poplar Bluff, Missouri) Daily American Republic and the James Farm Journal. He lives in St. Louis, Missouri. Author Beights puts his readers in the middle of Gads Hill's moment of truth.